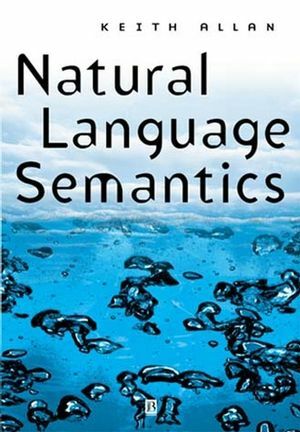 Natural Language Semantics discusses fundamental concepts for linguistic semantics. This book combines theoretical explanations of several methods of inquiry with detailed semantic analysis and emphasises the philosophy that semantics is about meaning in human languages and that linguistic meaning is cognitively and functionally motivated. Keith Allan is Reader in Linguistics at Monash University, and is a Fellow of the Australian Academy of Humanities. He has taught in Britain, Kenya, Nigeria, and the United States. His research and publications focus mainly on aspects of meaning in language and his previous books are Linguistic Meaning (2 volumes, 1986) and Euphemism and Dysphemism: Language Used as Shield and Weapon (co-authored with Kate Burridge, 1991). 1. Some Fundamental Concepts for Semantics. 2. Words and Worlds and Reference. 3. The Lexicon and The Encyclopedia. 5. The Power of Words: Connotation and Jargon. 6. Semantic Relations between Sentences. Predicate Logic, Sets, and Lambda: Tools for Semantic Analysis. 8. Frames, Fields, and Semantic Components. 9. Cognitive Semantics: Backs, Colours, and Classifiers. 10. Using the Typical Denotatum to Identify the Intended Referent. 11. Mood, Tense, Modality, and Thematic Roles. 12. The Semantics of Clause Predicates. "The field of semantics within linguistics needs Allan's book to stand as a marker of the clash of two traditions (the formalist/logical tradition and the pragmatic discourse-based tradition) and as a partially successful attempt to integrate these traditions and to produce a workable synthesis of them. The work is extremely impressive from the point of view of scholarship. Allan is clearly widely read, and has given deep thought to the central problems of the field." James R Hurford, University of Edinburgh. "Allan's book is a wonderful and useful addition to the semantics literature. It covers all topics, from formal to conceptual, to typological, and does so with insight and accessibility. I especially like the problems, which are well thought out and effective teaching tools. Allan is to be praised for taking on the immensely difficult task of writing this book and producing such a good book." William Frawley, University of Delaware. Provides a detailed overview of semantics, including both its history and recent developments. Examines and compares a range of semantic theories and methods of analysis. Integrates semantics and pragmatics, formal and conceptual/typological semantics, as well as theory and practical problem solving. Includes exercises to reinforce the text and test understanding.